For me there are probably no sadder words for a black belt to utter, however I believe for the vast majority of martial artists this is true. Often times this comes during a discussion where the scenario is posed that the person is faced with an attacker, the threat is real and dangerous and they have a weapon available such as an edged or impact weapon, excluding a gun of course. I have talked with and seen instructors who will demonstrate dropping the weapon and assuming a sparring type stance when given this scenario. Now this isn’t about a higher moral code that they must do karate and karate is an empty hand system; rather it is because they feel most confident in their empty hand skills and they feel unconfident with a weapon. However if they were allowed a gun, even if they weren’t familiar with a gun they would take the gun because of its vast superiority of empty hand defense. This is so backwards thinking. In a stressful situation they believe they would be able to draw their gun, get the safety off, chamber a round, point and shoot with no or minimal training. Consider that it has been proven that an assailant can generally get to a person (even trained to use a gun) in 20 feet or less before they can deploy their gun for their defense. I believe this stems from an over trained mindset that gives martial artists the idea that everything happens as it does in the dojo. 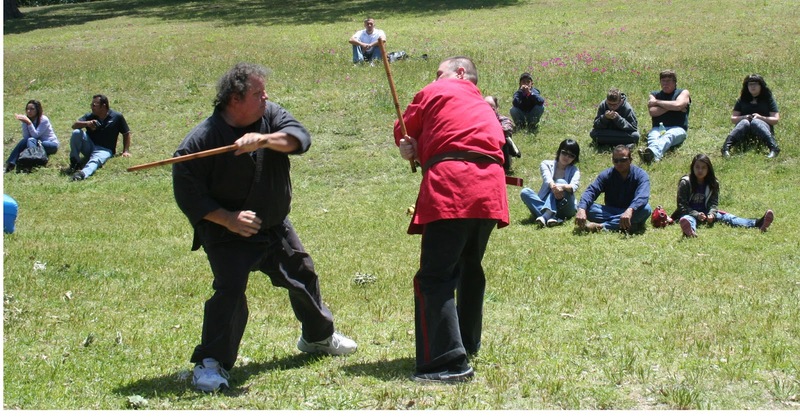 When it comes to using a stick or a knife in a defensive situation generally martial artists think of in terms of a stick or knife fight a duel so to speak. Generally speaking when we (martial artists) practice one steps (application drills) in our (as in most public ) dojo, it is with our partner getting into a stance and then attacking as we defend against one or two strikes as if it were a duel. This is for safety sake so the person doesn’t attack when their partner isn’t ready and an accident happens. But attacks on the streets don’t follow those rules like in a dojo, we aren’t allowed to stretch, to warm up, to square off with the attacker and give him the permission to attack when we are good and ready etc. etc. Like wise because the gun is a projectile weapon that is generally not taught in martial art dojos; we don’t think of having to deploy the gun as in terms of a gun battle; with shots possibly going on around us, or a person with a knife charging at us etc. etc. The simple fact is when faced with an attack we’re not dueling, we are fighting to protect our lives. The impact weapon or the edged weapon used in a self defense situation is generally a tool; a common item from the picked up from the surrounding environment, not a fighting weapon carried on the person. 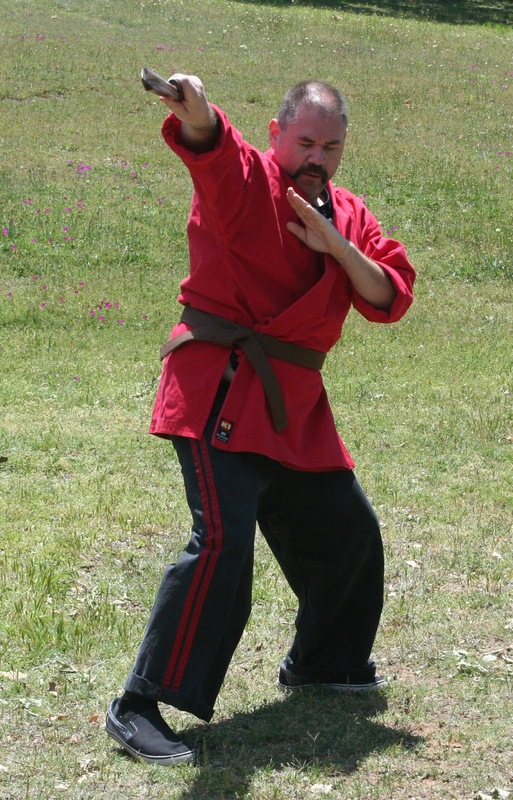 We (martial artists) should train to use weapons that are on us, or in our surrounding areas. For instance the weapons of the pioneers, or mountain men of old were single shot firearms and what tools they had on them at the time. For instance some pioneers carried hatchets and knives on them that helped them cut wood, skin and eat their meat, and basically help them to survive in a harsh world. If faced with an adversary who is charging towards them, they wouldn’t, if they missed with the single shot bullet, throw down their knives and hatchets to try and face them with nothing because they were considered just tools. Instead if they missed with the first shot they might use the gun to try and club them, or perhaps toss the gun to the ground to draw the knife and the hatchet to fight them off. They knew that to survive when their life depended upon it they used whatever was available to help them win. They knew this, they accepted this, their lives depended upon this mindset, it was plain common sense. From 1988-90 there was a show on TV that stared Samo Hung where he played a LEO from China called Martial Law. One of the great things about this show was the fight scenes, Samo Hung would use any and everything to fight the villain with. If they were in the kitchen he used pots, pans, kitchen utensils you name it he used it, if in a room they used lamps, chairs etc. etc. This is the mentality we as martial artists should have. Use what is available and what gets the job done, again this is common sense. Today though with all of our training in the martial arts, sometimes we don’t have the settler’s mindset, sometimes we don’t have even common sense. Rather we have a false sense of security in our training in the dojo that we can defeat anyone or stand a better chance at survival if I disregard any items that might help me survive and face down a potential threat empty handed because I take karate or Tae Kwon Do or Kung Fu. Instructors need to consider this as well; think about what example you are setting for your students. You are in effect saying that your empty hand skills are superior (and in a sense telling them by proxy that their empty hand skills will be too) so you don’t need to rely on anything but your empty hands. When in fact what you should be teaching them is; to use whatever is available, to use whatever stacks the deck in their favor so they can come home to their families and their loved ones. This type of thinking, this type of mind set, forces us out of our comfort zone. In the dojo you are in control of the perfect world. You know exactly the right steps to take to off balance the attacker, you are stepping on the comfortable mat that provides you the sure footing, you have the attacker that is only going to attack you with a prearranged attack when you say so and so on. In the dojo life is good, we always win and the opponent never fights back, basically it is a fantasy. If as an instructor you feel more confident facing down an armed adversary with knife, empty handed, instead of say; grabbing a back pack, using a trash can lid, grabbing a tire iron, a mop or a broom, a pan of hot water off of the stove etc. etc. I believe that you need some more self defense scenario based training. Well we got through our first public “official” demonstration Sunday at the Bedford Boys Ranch taking part in the annual Third Tradition M.C. fund raiser event. The Third Tradition M. C. is a clean and sober motorcycle club and this is an event where they raise money for local charities. We were asked to do a demonstration through one of the organizer’s of the event, Shane Sutton, who is a member of the Leading Edge networking group I go to. All in all it was a l Every one who participated and all of the parents who took time out of their day/nights to support your kids and our group (Hidden Sword Martial Arts), I personally want to thank you. ot of work on everyone’s part for such a small demo time wise. Like the martial arts it is the journey and all of the hard work getting there that counts. On our first night trying to organize this I had three students show up, Brooke and the twins. It was a bit discouraging but…… I was glad to see them. We had up to 30 minutes to fill with three students and myself, oh, and Jackie and Kevin. That first night I figured it was going to be one of the shortest demos ever. We discussed what they would do and practiced. In fact I think that night I used the time to teach Brooke her next kata Yul-Gok while I worked with the twins on it. Anyway after the first night I didn’t know what to expect. The 2nd night the following Wednesday we had, I think, nine students show up so now we’re talking, oh and Jackie and Kevin. I tend not to include Jackie and Kevin in my student counts since they are more fixtures at the school, always there and always supporting the school in one way or another. After discussing what we were going to do I assigned the students to Jackie Kevin or I to work with them in a smaller group. Here we found some real surprises. Probably the biggest surprises where Matthew and Isaiah. Matthew chose to do double sticks and under Jackie’s guidance they did a double stick drill that was awesome. She tied together three drills; Single Sinawali Standard, Advanced and what we call Advanced 2 into one flow drill plus taught him foot work on top of that, all in 30 minutes to a young boy. 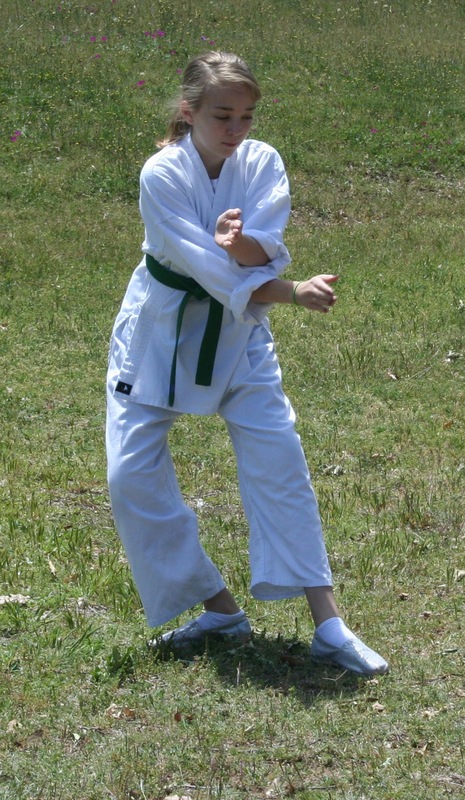 Matthew then over the next three workouts continued to work on the drill and performed it not only at the Boys Ranch but also as a short demo at sensei Starnes karate school in Bridgeport during a black belt exam. 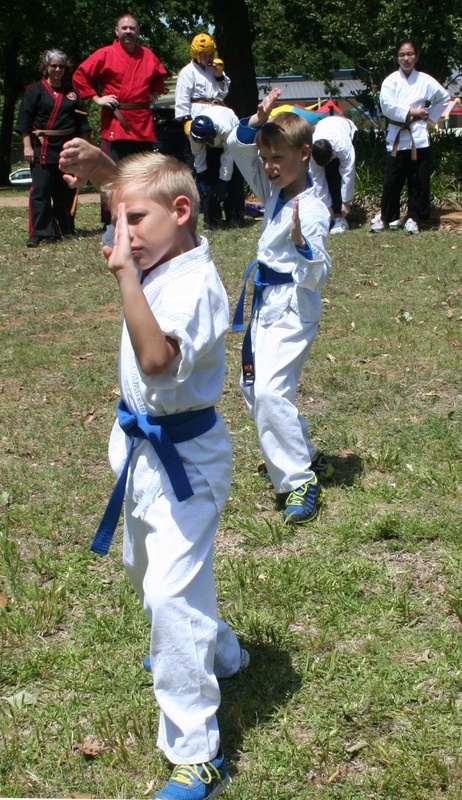 Isaiah wanted to do the Nunchaku kata I have taught the students this year. Not only did Isaiah do such a good job on it that he beat out a higher ranked student to do it on the demo, but he continued to improve dramatically with each workout leading up to the demo. Isaiah really put his heart into the kata and it showed. We were all really proud of him and the progress he showed. Bryce, the twins, Kevin and Brooke all performed different kata on the demo. Bryce wanted to do Hwa Rang but I told him I wanted him to do Kwan Gye since I had another student who wanted to do Hwa Rang. I taught Bryce Kwan Gye (which is an alternate 1st dan kata and a required 2nd dan kata) because I felt he helped him to display his kicking skills several months ago. Bryce graciously stepped up and complied with my request and worked hard on that kata for the demo. He did a great job. The twins did a synchronized kata of Yuk-Gok which was really good. Their kias (KIA!!!) were so together I only heard one instead of two. Kevin, as the demo classes progressed, suggested that he do our Modern Arnis stick anyos (forms) strung together. Which he did at the demo, he was afraid that it looked like the famous Amer-ri-Do- Te “Hurticane” but it didn’t. He actually looked very solid like a Modern Arnis practitioner. Brooke stepped up and did two katas Toe-San and Anyo Dalawa (Modern Arnis form 2). Brooke is a great form student considering her rank; she knows all her katas for her next rank plus the first two empty hand anyos (forms or kata) in Modern Arnis, the nunchaku kata that I’ve taught the advanced students, and she now has learned Yul-Kok for the rank after her next rank. She is an exceptional student of kata. Demonstrating self defense we had Leilani and Kate, they worked out a demo showcasing one step combative drills and then self defense. Because we were working on grass the ladies didn’t get to show their takedowns doing the one steps or self defense which was a shame. For safety sake they inserted shoves instead of the takedowns which is less dramatic, less exciting, but they both did a great job. The students all finished off with sparring which was a last minute addition to the demo. I had been working with Hunter on demonstrating the Nunchaku vs. Bo one steps but it was felt that sparring would be more exciting in the long run. So we had Hunter spar with Kate and Bryce in one on one and two vs. one matches. Jackie Kevin and I worked on arnis drills after the kids left each evening. We strung together parts of different drills and changed up a lot of things. Kevin and Jackie worked outside of class on their drills together at home where they strung together double stick, single and double sinawali patterns in different drills. During class they worked with me on the flow drills we would be doing. Jackie and I also demo’d at the belt exam on Friday night along with Matthew and Jackie. It is hard when you start working at speed not to go into survival mode and go for a disarm, or a lock, or to seize an opening, but instead forcing yourself to stay on track with your partner and to do the drill. We deviated from the agreed upon sequence several times but over all I’m quite pleased with the performance. While our demo at the belt test possibly generated some interest with master Starnes’s karate school in arnis, doing a demo there allowed a couple of our students to perform in front of a crowd for the first time and over all I believe, we did real well. Preparing for Thrid Tradition M.C. demo allowed me to discovered some things about our students that I hadn’t really seen before like Matthew’s desire to learn double stick drills, I also saw the passion that Isaiah has for practicing the Nunchaku, I saw Bryce step up and bring forth an attitude in his katas that frankly I hadn’t seen in a while. Looking back at all of the effort, all of the extra classes, all of the extra scripting, the discussions, the coaching the practicing that went into a 10-15 minute presentation; as an instructor you have to wonder was it worth it? OH YEAH! Because for our first demo we did good, we raised the bar at our school, we met a challenge that we hadn’t done before, and the students enjoyed it and learned from it. So I’m looking forward to Roanoke Days this year when we will once again get the students up on stage to promote our art and our school, hopefully we will raise the bar even higher next time.